It is still not too late to see Maine Sublime: Frederic Church's Landscapes of Mount Desert and Mount Katahdin -- a gem of a small exhibit which closes October 27th. The exhibit, guest curated by John Wilmerding (the Christopher Binyon Sarofim Professor of American Art, Emeritus, at Princeton University -- whose books have a prominent place on my living room table), the exhibit first travelled to the Portland Museum of Art and now can be seen at Olana State Historic Site, Frederic Church's home on the Hudson River in Hudson, New York. As Wilmerding writes in the exhibit's catalogue essay, "We now recognize Frederic Church as one of America's great artists of the nineteenth century." 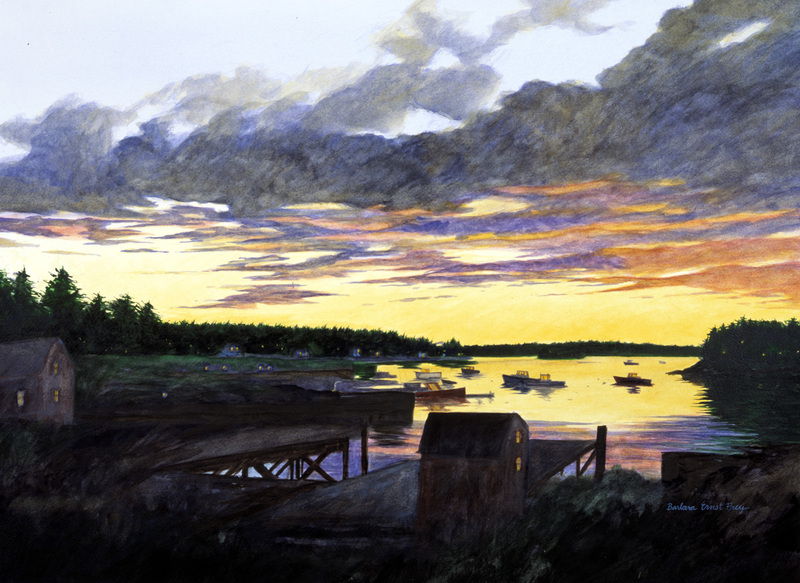 While famous for his scenes of the Arctic, South America, and the Near East, his landscapes of Maine were central to his career for over four decades. The Maine material presented in the exhibition ranges from finished oil sketches that Church displayed in his home to pencil sketches and cartoons that he stored in portfolios and shared with friends, fellow artists and guests. 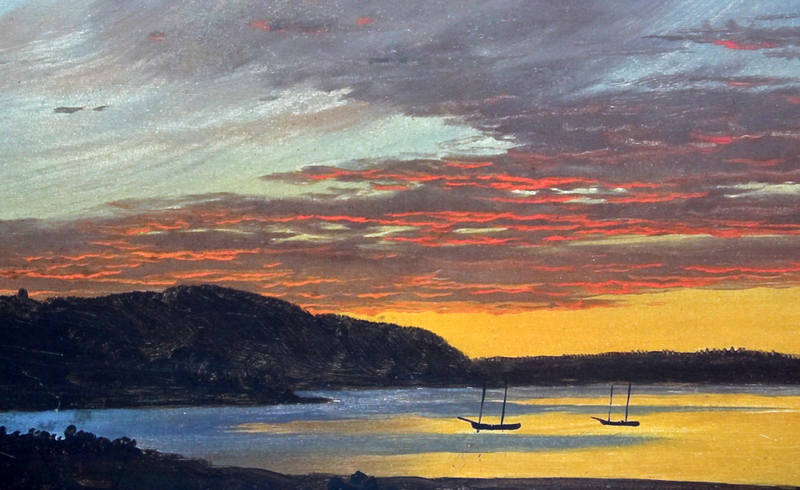 The artist first journeyed to Maine in the summer of 1850 spending six weeks on Mount Desert exploring the coast. Over the next decades Church continued to visit Maine making over a dozen trips. He even bought land overlooking Mt. Katahdin. The Olana guide said that Church did not paint his paintings on site but rather did drawings. I am currently painting in Maine and am wondering if Church wasn't on to something here. Twice today my easel blew over, knocking one painting into the sand and emptying the turpentine bucket (luckily there is an art store in town so I was able to replenish my supply). Yesterday it started to rain on my painting, and the gray sky I thought was so intriguing against the fall colored backdrop proved to be otherwise. I did however, like Church, watch the sunset today as that time of day has also served as inspiration for my paintings. A drawback to the exhibit is if you do not visit it during special viewing times you have to see the exhibit at the end of the Olana house tour as the exhibit is in two of the upstairs rooms/galleries. The exhibit is breathtakingly beautiful but because I was part of a tour my time was limited. It really didn't allow time to carefully view the paintings. Olana is a beautiful spot, particularly this time of year. Not far away is Thomas Cole National Historic Site, the home and studio of Church's teacher. The current exhibit is Albert Bierstadt in New York and New England. Both are good starting off points to explore the Berkshires in the fall - and, if you are in Williamstown not too far from Olana, stop by our new gallery The Barbara Prey Gallery to see my new paintings in the just opened exhibit Peak Colors. Barbara Ernst Prey has painted watercolors for four decades, her paintings are in the collections of The White House, The Brooklyn Museum and the Smithsonian American Art Museum. She was appointed by the President of the United States to the National Council on the Arts, the advisory board to The National Endowment for the Arts. She graduated from Williams College with honors in Art History and earned a master's degree from Harvard University. She received a Fulbright Scholarship and a grant from the Henry Luce Foundation, enabling her to travel, study, work, lecture and exhibit extensively in Europe and Asia.